Growing up during Vegas summers, the only respite from the heat and from the interminable brown carpet inside digs of Ms D's (babysitter notsoextraordinaire) place was her backyard pool. Summer of 1984... the radio would blare, 12 kids would run around screaming on wet cement with nary an adult in sight, and every time the Pointer Sisters' song "jump" would come on, we'd throw ourselves in and out of the pool every time they would sing that summer pool word (jump!) It became a dizzy merry go round of chlorine and screeching, brown bodies and no winner. If it could be, pooling would be a verb for all of that. Not so bad, eh? You know my penchant for orange. I'm not one to complain about the nature of handpainted yarns, but I am glad the orange will be on the front of the cuff and not the back. I really don't like the green-white-blue-white single row action, its way too busy to my eye. 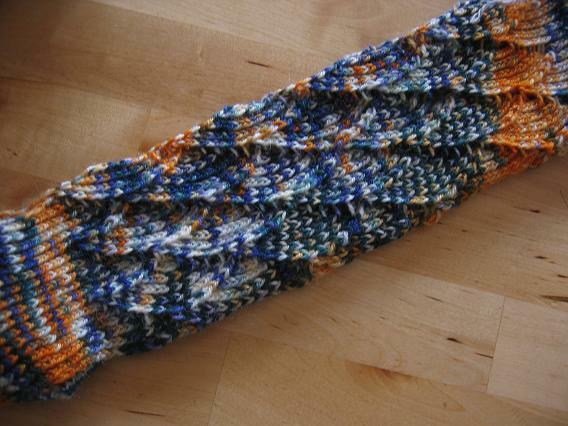 (I forgot-- this is Pomatomus in Lisa Souza Sock! Bird of Paradise colorway). There is only a 4 st difference (72 versus 68) between the number of sts on the cuff and what is the decreased # on the foot after the gusset shaping is all done. This is the kind of variety I was hoping for on the leg-- it looks like it will remain stripey on the way down the foot. 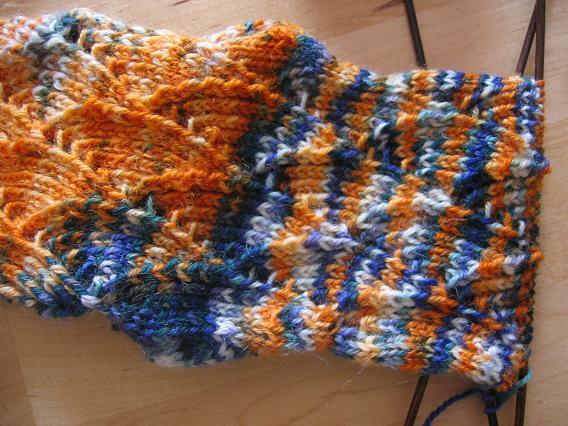 I'm 2 pattern repeats done with the foot, with at least 1.5 more to go. I started the cuff on US 2's and knit 4 repeats (instead of 3) for a longer leg-- I was almost positive I would have enough yarn for a longer leg, and still pretty much ascribe to that view. I switched to US 1's for the heel and thereafter-- I think the 1's are better for this yarn, though the leg isn't bad at all. I just wanted a tighter knit stockinette foot and know the pattern will stretch well enough to compensate for the change in needle size. In non pooling news, I still remain the luckiest blogger around lately. I was a winner over at knitspot's (of "we're knot taking it anymore! 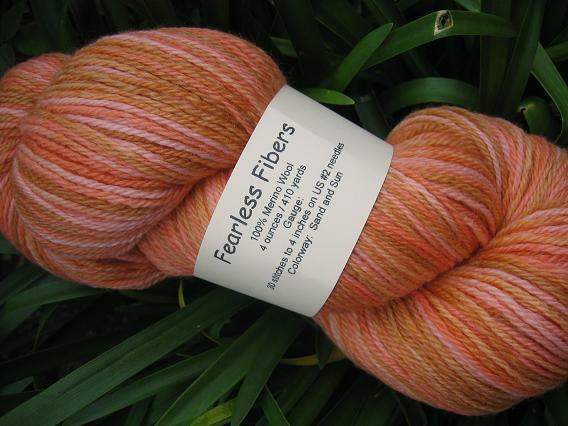 "/national yarn rant day fame) Stalk n Knit contest and got to choose my poison from Fearless Fibers' sock yarn wares! Isn't it... *pretty*? The warm weather has softened my heart to colorways like these, and none too soon! I love it. You may ask why its already balled up? When I still have a second Pomatomus to knit? And have a secretly balled up hank of Trekking waiting for me too? *there was the commercial that played on vegas tv all of the time when i was growing up... c & r clothiers i think-- the refrain went, "what a difference a day makes, 24 little hours. what a difference a day makes, and the difference is you..." there would be these cuts of sweaty, 80s type spandex workout bedecked, construction rugged, almost scruffy but not guys and as the commercial went on, the guys would be all transformed and non-shiny and shaved in suits when the "...difference is you" refrain would peak. yeah. Very pretty yarns! Weird how all that orange is in the front of the Pomatomus and totally different and "speckly" almost in the back! Right now I'm knitting plain grey ribbed socks for the Step-Pa-in-Law for Sunday. Bor-ing! Can't wait to start something for me (probably Hedera). I'm also looking forward to the new Knitty. I check every day! Can't wait to see your design! Hello Aija: Thanks for sending me your blog link. Great blog! All of your super-cool socks have inspired me. I keep saying I need to stop knitting socks and get into something else, but now you have me hankering to start yet another pair! And I'm so glad you like your Fearless Fibers yarn prize. I can't wait to see what you knit with it. 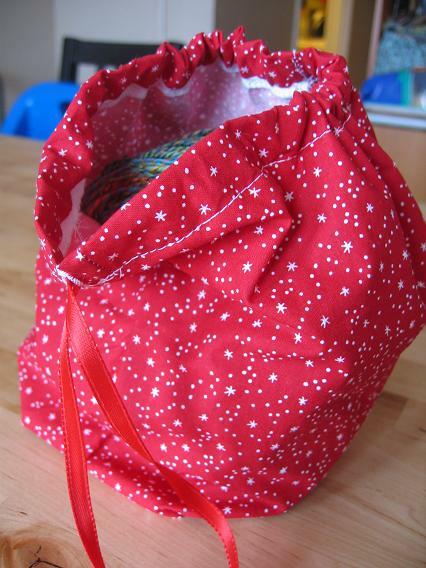 What a cute little knitting bag, with it's little ball of yarn peeking out. Ooops, I just saw it was Lisa Souza. You know I was wanting it to be STR! But not the Lisa Souza, I love her yarn! 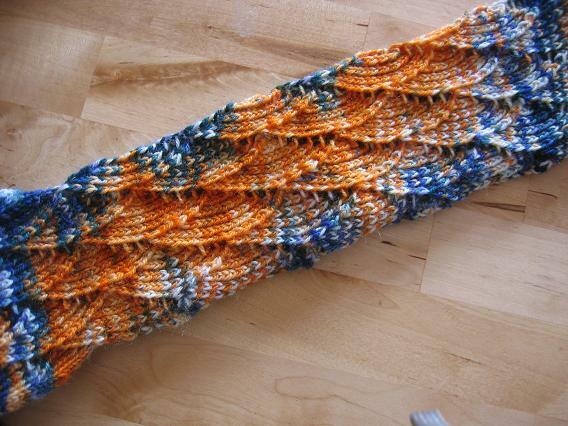 The pooling is fascinating! 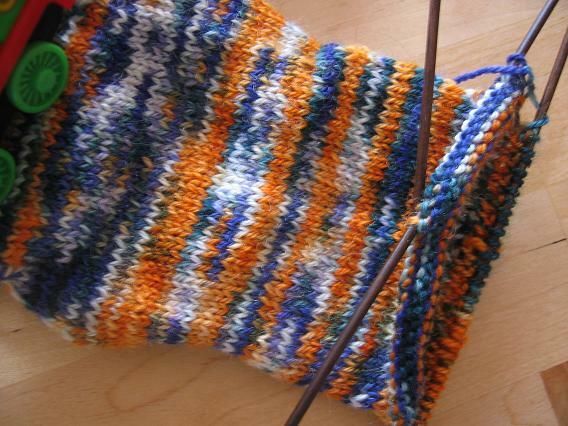 I love the Pomatomus pattern; you are such a good sock knitter :). And what a sweet, starry bag. Very nice on the Fearless Fibres -- lucky you! The Potam... sock is quite, ummm, interesting. Gotta love the challenges, and joy, of handpaint yarn! Oh the joy's of hand painted yarn - never know what your gonna get! They look great! Love the bag! You won another one? Go you! I love the pooling on the pom..pot..pomoto..pomatumm... I love the pooling on the sock! Great colors. We want to know if that's Percy in the background, hidden? The Pom is looking great! It is weird the way the color changes from leg to foot- I can't wait to see if the second one looks simlar or very different. I think the socks look great on either side. The blue reminds me of waves. Anyway, congrats on the win, you deserve it and the knitting bag rocks! I love the sock! The pattern is really cool. Nice orangey yarn too... this is a new company to me; I'll have to check them out! I couldn't have helped w. the pattern problem but the smart knitter you are, you called out for help. Cool tips you got! Interesting how the yarn colors came out - I like it. I can hear Sarah Vaughan doing her siren song in my head now. Oh wait, I'm sure there were lots of other versions of this song, but this is the one I know and love. The pooling/ non pooling quality of your socks is really interesting. Makes me afraid of using handpainted yarn now since I like to know exactly what I'm going ot get! Yeah, I know. That's not really all that much fun. Lovely photos. I can completely see the Bird of Paradise in the P-sock. 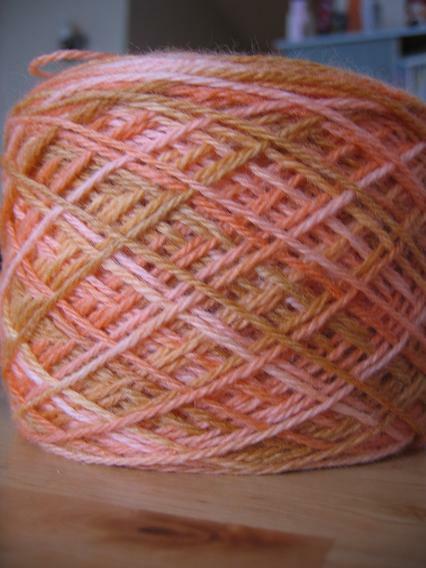 I am roaming the Web for Pomatomus pix, as I think I am doing chart 2 wrong-the left edge thing is throwing me. I have Wisteria from Fearless Fibers. Cute knitting bag. I feel like I should wash mine after dragging it all over Nawlins.